Tomatoes, cucumbers and sweet peppers - a classic combination for a summer salad vitamin. This trio can be supplemented with original sauces, cheese, herbs and other supplements that increase the dish. 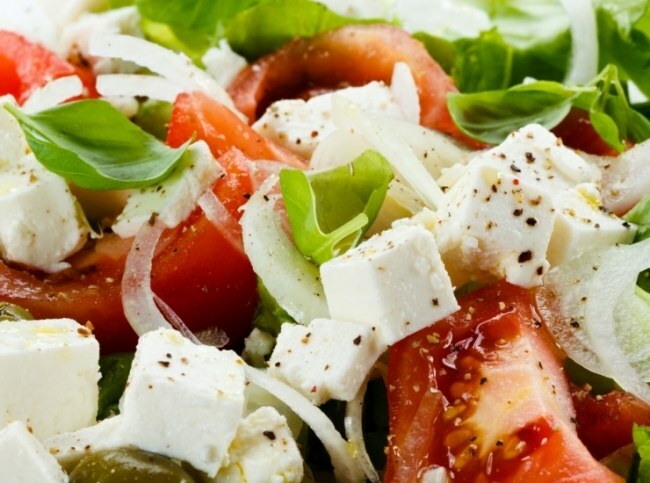 Try to cook salad of tomatoes, cucumber, pepper and cheese. This traditional Bulgarian dish turned out delicious, choose ripe meaty tomatoes with a sweet flavor. Wash and dry vegetables. Tomatoes cut into slices, cucumber slices, and pepper strips. Cheese finely chop. In a large bowl mix the vegetables, drizzle them with oil and freshly squeezed lemon juice, add salt. Sprinkle top of salad with bits of cheese. Serve on its own or as an accompaniment to grilled meat, fish and sausages. "Shopska" salad can be prepared without cheese - often served with vegetable table. If you prefer a more savoury, add tomatoes and peppers potatoes and baked beans. With this set of products particularly well to be in harmony not fresh, and pickles. Potatoes rinse and boil. Cool it and peel. Sweet pepper remove seeds and partitions. Tomatoes scald with boiling water and remove the skin. Pepper cut into strips, potatoes, tomatoes and pickles - thin slices. Green salad tear into medium-sized pieces, mix with chopped vegetables and canned beans. Prepare the sauce. In a separate bowl pour the yogurt, add salt, mustard, freshly ground black pepper and lemon juice. Mix well and pour over the salad dressing. Before serving, garnish the dish with slices of hard-boiled eggs and finely chopped parsley. Include in vegetable set eggplant. Their flavor works well with garlic - the salad will be more sharp and spicy. Cucumber salad can be fresh or pickled. Eggplant bake in the oven. Tomatoes pour over boiling water and peel. Do peppers remove seeds and partitions. Eggplant, cucumbers, peppers and tomatoes chopped cubes, mix them with chopped garlic and dress the salad with oil, vinegar, salt and pepper. Mix well. Salad serve fresh white or whole-grain bread.